It’s no secret that BMWs are quite popular around Oppo, and quite popular with myself, personally. But there’s this stigma that comes with the BMW talk that revolves around the fact that the brand just does not seem to compare to the roots upon which they were born. The classic chassis codes: “E30,” “E28,” “E39,” all read out as legendary names to us all, and yet none of us seem to want to care for any of the brand’s modern offerings. It’s sad, but it’s also reality. But, BMW doesn’t seem to be down and out quite yet. Just when the fourth round seems to be dwindling, BMW comes out with a heavy hitter: the 2 Series. 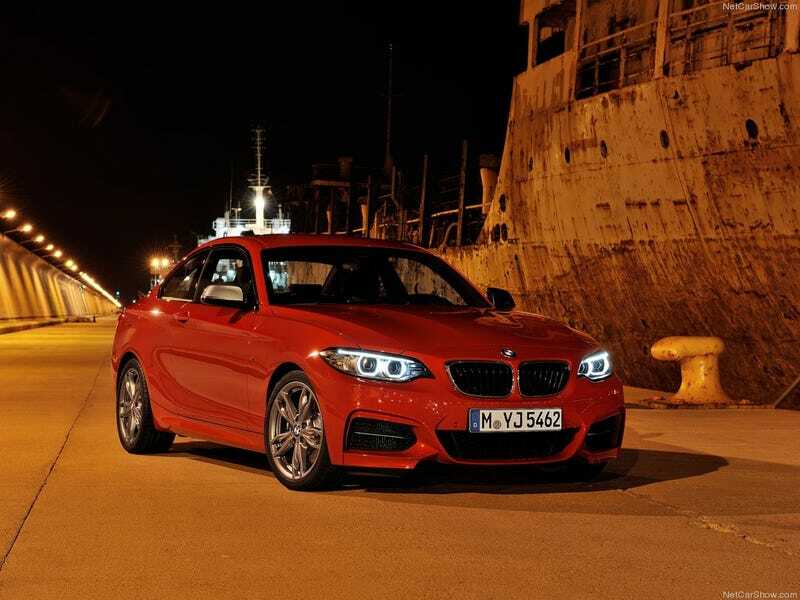 The 2 Series, much like the 1 Series Coupe before it, is largely everything a BMW should be. It’s a modern interpretation on the formula that made BMW so profitable and so desirable to enthusiasts everywhere: the short-wheelbase, rear-wheel drive coupe. It exceeds due to its simplicity compared to the big guns like the 3 and 5 Series of the modern era. That’s why it’s my most favorite modern BMW, period. With the talk of the M2 and new M2 competition, I thought it only fair to put together some sort of something to talk about how much I love the 2 Series. Luckily, the higher powers agreed, because I was blessed with a transferred in M235i at work that I got to have my own way with, and boy, was it an absolute treat. In fact, I’d go so far as to say it’s the best BMW made within the past decade. Decked out in Glacier Silver Metallic over Oyster leather (sorry for the lack of pics, it was raining), the M235i at first glance gave me a sense of nostalgia, a theme which you may have noticed is fairly common in this review. Just a few weeks before then, I was considering a 128i for my daily after praising its perfect proportions and direct steering, but eventually backed out after the inability to find a perfect one. But when given the keys to this M235i, I suddenly felt that wanting energy once more, enhanced only when laying your eyes upon its stubby, yet sleek architecture. To call the M235i a pretty car is subjective. Some might like its muscular philosophy, a car that can only be likened to a pitbull, or maybe an english bulldog if you feel like the pitbull comparison is only fair for the mack daddy M2. But I’d hardly call the car ugly, it’s a modern interpretation of the ideal form, harkening back to famous nameplates like the 2002tii or the E30 M3. Petite, perhaps. In any other car of this stature, the numbers that the twin-turbo N55 inline-6 puts to the road could be seen as overkill, but something about the 322 bhp it boasts just seems right. When mated to the 8-speed ZF automatic that my car had, it gets from 0-60 in a stout 4.8 seconds, which is a respectable number for this class. The car’s lightness and quick shifting mannerisms of the transmission really play into its favor, however, as most speeds feel so much more when behind the wheel. Then you find yourself in a corner, and it all comes back to you. The M235i, is, for a better word, perfect to drive in a switchback. The short composure of the wheelbase, RWD architecture, and powerfully direct steering make the car so perfectly nimble and composed in every single corner. Turning the wheel brings you such direct feedback, with the slightest bit of kickback oversteer to make it all the more delightful. Even piloting it through a small back lot gives you a sense of joy, as you could easily flick it around any tight enclosure with maximum ease. It’s, for lack of a better word, f**king amazing. For all of the praise with the way it looks and drives, I was really hoping the car would be an overall home run, but I couldn’t walk away without giving criticism where its due, and unfortunately, it’s largely due at the behest of the interior. While I’d hardly call this a bad interior, it’s not up to the standards I hold BMW, which is a common complaint I’ve had for most BMWs up until recently with the debut of the G30 5 Series. There’s a lot of un-sultry plastic in places where I’m not exactly a huge fan of it and the wood trimmings here and there seem too obviously fake (which is an even bigger problem if they’re real). But, I’ll give it one thing: the way everything’s laid out in composure to where the driver sits is well done. Nothing is too far out of reach, and honestly, for a car as small as this, and for a guy as big as I am, I really couldn’t complain about comfort one bit. If there was one thing I’d like to say about the M235i that’s really not its fault, it would be that I’d like to try one with the 6-speed manual. Of course, the automatic is quicker and didn’t demote anything from the thrashing dynamics of which it drove, but I’d just love to see how it behaves with a classic row-your-gears attitude. Nevertheless, I can overall say I walked away pleased. To me, the naturally-aspirated, V8-powered, RWD E39 M5 will always be the ideal BMW, but the M235i comes in a damn close second place. It has all the right ingredients to be perfect, and flaunts them in all the correct places, and apart from a few niggling issues, I’d still own one in a heartbeat. If you, or anyone you know, is looking for a moderately priced pre-owned BMW, I’d seriously recommend one of these before the prices skyrocket, because who knows how long we’ll be able to buy BMWs as good as this anymore? But until that day comes, I’ll smile at the roundel for knowing they’ve still got the touch.